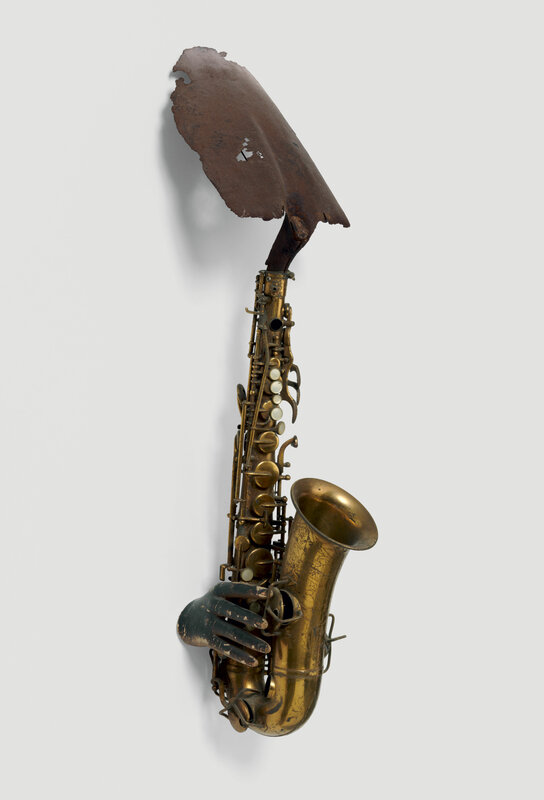 This assemblage from 1973 is a tribute to Charlie Parker, the iconic American jazz musician. Parker was known as "Yardbird" or "Bird" throughout his career and alluded to this nickname in many of his most famous compositions, including "Bird of Paradise," "Ornithology," and "Yardbird Suite." The African American musician, who died in 1955 at the age of thirty-four, remains one of the most influential saxophonists and composers in jazz history. Bird is composed of a saxophone, mannequin hands, and a spade. This work—in which Hammons makes a slight "dig" at the word spade, a derogatory term for a black man—expressly connects the crafts of two talented black artists. "Bird." Now Dig This! Art in Black Los Angeles, 1960–1980 Digital Archive. Los Angeles: Hammer Museum, 2016. https://hammer.ucla.edu/now-dig-this/art/bird.